St. Bernard Parish, La. (March 24, 2017) — Judges announced Reactive Digital Systems, LLC the winner of the third annual Startup St. Bernard presented by the Arlene and Joseph Meraux Charitable Foundation and the St. Bernard Economic Development Foundation in conjunction with New Orleans Entrepreneurs Week. 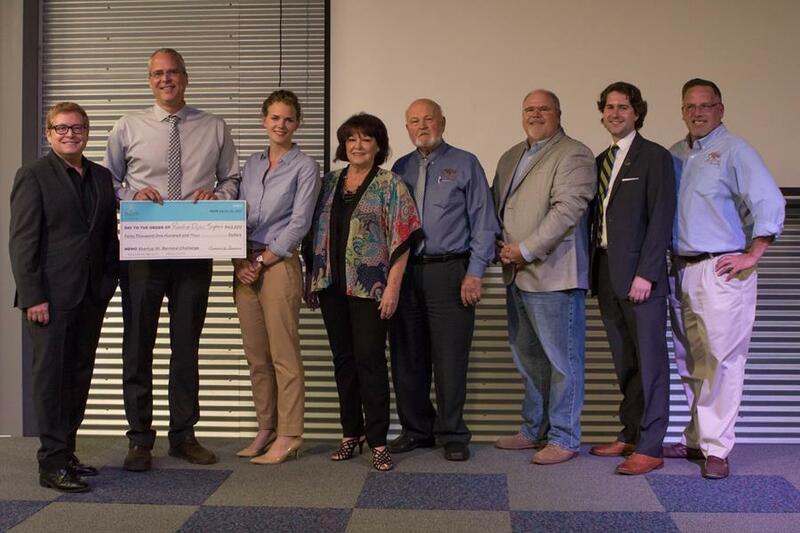 Reactive Digital Systems, LLC took home a prize package of cash and in-kind services valued at more than $120,000 designed to help propel their business to the next level. The St. Bernard Parish-based company was one of five finalists to pitch their business at the live “Shark Tank” style public event at the Meraux Foundation’s Arlene Meraux River Observation Center at Docville Farm on Monday. Reactive Digital Systems, LLC is on the forefront of augmented reality education. Augmented reality reacts to user input, engaging learners of all ages in a wide field of studies, and it is the new frontier of interactive education. The company produces TopoBox, a cutting-edge educational instrument that projects an augmented micro-reality on a “sand box” that users can manipulate. The high-tech tool allows individuals to learn about topography, geography, natural sciences, watershed, and computer sciences. Videos and more information are available on the company’s website at www.topobox.co. Other finalists included Crescent City Seafood Connection, a local seafood distribution and wholesale company; Da Parish Kayaks, a fishing kayak rental and guide service; Functional Health and Wellness LLC, a fitness company; and Leduc Entertainment, a creative-based production company. Prior to yesterday’s pitch event, the five finalists were selected out of a pool of entries. Startup St. Bernard was open to any business that agreed to locate their base of operations to St. Bernard Parish, help improve St. Bernard Parish, and become part of the St. Bernard Parish entrepreneur ecosystem. Finalists were identified by an independent scoring committee based on the criteria published on the entry form, including the quality of their business plan and impact on St. Bernard Parish. The finalists' pitches were judged by an esteemed panel of businesspeople, including: Jimmy Roussel, CEO of the New Orleans Startup Fund; Cleveland Spears, President and CEO of Spears Group; David Fennelly, Director of Associated Terminals LLC and President of Turn Services LLC; Aaron Dirks, Founder and CEO of Deluxe Shuttle, Chairman and Co-Founder of Posigen, and Director of Business Development at Limosine Livery; and Erica Larkin Gaudet, sculptor and owner of Larkin Gaudet LLC. WYES-TV’s Tom Gregory emceed the event. The $120,000 prize package was a combination of cash and in-kind services. Donors include: Meraux Foundation, Park Investments, Ltd., St. Bernard Parish Government, Palms Truck Stop, Sidney Torres, III, Chalmette Refining, Mrs. Rita Gue, Mr. Floyd Gue, Nunez Community College Foundation, Taurus Properties, Inc., Southern Insurance Agency, Palmisano Contractors, Sheriff Jimmy Pohlman, Senator Sharon Hewitt, Senator JP Morrell, 40 Arpent Brewing Company, Christie’s Dreams Seafood, Terry and Daryl Tedesco, and Coast Roast. In-kind sponsors include: Meraux Foundation, Park Investments, Ltd., 40 Arpent Brewing Company, Christie’s Dreams Seafood, Gulf Coast Bank & Trust Company, John Brian White, Esq., inHouse Consultants, Inc., & AdamsIP, LLC, evanSchmidt Design, LLC, Sherman Strategies, Ragusa Consulting, Bernard & Franks, Baker Donelson, Kushner LaGraize, LLC, St., Bernard Chamber of Commerce, Biz New Orleans, Shine Productions, Outfront Media, Ditto’s Printing and Copy Center, Global Staffing Solutions, Bill Haines, Crave, and Grow St. Bernard. America’s Small Business Development Center provided all finalists one-on-one business mentoring sessions in preparation for the competition and Nunez Community College led an advisory committee to provide guidance and feedback on the finalist’s presentations. The inaugural Startup St. Bernard winner, 40 Arpent Brewing Company, hosted an after-party at their taproom in Old Arabi. Startup St. Bernard was held in conjunction with New Orleans Entrepreneur Week (NOEW), the annual festival celebrating business, innovation, and advanced thinking in metro New Orleans. Produced by The Idea Village™, NOEW engages a dynamic global network of entrepreneurs, investors, corporations, nonprofits, students, and professionals to support growing companies and elevate entrepreneurial success through eight days of discussion, debate, education, competition, and celebration. This year, the festival takes place March 19-24 and over 10,000 are expected to be engaged through over 100 different events. St. Bernard Economic Development Foundation is 501(c)(3) nonprofit organization founded in 2005 to promote economic development and commercial growth of St.Bernard Parish and to lead the initiation of partnering organizations seeking to improve the quality of life for St. Bernard Parish citizens. To achieve this mission, SBEDF primarily engages in business attraction, retention, and expansion. Additionally, workforce development and policy development are pursued as key initiatives to drive economic development activities. The Board of Directors consists of 28 voting members and 8 non-voting honorary members and public officials, all of which serve as volunteers to the organization. SBEDF’s work is made possible through the general support of its investors, St. Bernard Parish Government, St. Bernard Port, Harbor and Terminal District, the Arlene and Joseph Meraux Charitable Foundation, Cox Communications, Chalmette Refining, and Valero at the Champion Level, Law Offices of Sidney Torres, III and Associated Terminals at the Pillars Level, Palmisano and Meyer Engineers at the Community Leaders Level.